The island of New Guinea — which sustains the third-largest tract of intact rainforest on the planet — is becoming the latest global deforestation nightmare. Long-protected from exploitation by its remoteness, steep terrain, and fiercely independent native peoples, the island is now rapidly losing forest to logging projects and palm oil development. In 2015, deforestation across the island leapt by 70 percent above the year before. In 2015 and 2016, the island — governed by Indonesia in the west and the nation of Papua New Guinea in the east — lost 524,500 hectares of forest, an area the size of Delaware. This is greatly alarming from a biodiversity perspective. New Guinea is a biological wonderland, populated by Birds of Paradise, Tree Kangaroos, more than a thousand species of butterflies, and innumerable endemic plant species. It is also among the most poorly explored regions of the planet, with many species remaining to be discovered — species that might vanish before ever being studied scientifically. On the Indonesian side, the government is granting large blocks of forest to foreign corporations for oil-palm plantations. One of the most controversial projects, in Merauke District, is the POSCO Daewoo plantation. This South Korea-owned concession spans more than 34,000 hectares. A campaign by Mighty Earth, an environmental group, has prompted more than 20 companies to drop POSCO Daewoo as an oil-palm supplier. Under intense pressure, POSCO Daewoo says it is enacting a temporary moratorium on deforestation, but forests in most of its giant concession have already been felled. Elsewhere in Merauke District, a massive 1.2 million hectares of forest has been handed out to developers in a program dubbed the Integrated Food and Energy Estate. Some of this land will be converted to oil palm. Development in the Merauke area is especially worrying because of its extensive acid-sulfate soils, which are notoriously difficult to farm. Beyond major forest loss, large-scale runoff of sediments and fertilizers from expanding farms in Merauke could imperil some of the world’s most diverse coral reefs. On the other side of the island, industrial selective logging — much of it illegal — is taking a growing toll. While Papua New Guinea has struggled to contain out-of-control logging for decades, the situation has worsened considerably in recent years. Roads bulldozed into selectively logged forests promote deforestation – which rose almost 60 percent from 2014 to 2015. At the beginning of the decade, Papua New Guinea handed out 11 percent of its land area under so-called Special Agricultural and Business Leases (SABLs), mostly to foreign-owned corporations. These 99-year leases were meant to jump-start agricultural development, but instead they opened large areas of forest that had long been owned by native communities. Logging corporations used the SABLs to access old-growth tropical timber, often promising development projects that never occurred. Many corporations have been accused of corruption and bribery in taking land from local communities. The SABLs remain a social and environmental calamity in Papua New Guinea. In 2013, a National Commission of Inquiry found that most SABLs were illegally obtained. Soon afterward, the government said it would cancel all SABLs. However, five years later, most SABLs remain in place and logging is proceeding apace. 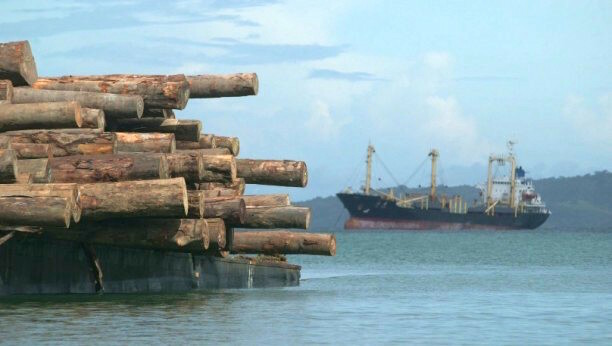 According to a report last year from Global Witness – a group that monitors international corruption and environmental crimes – most of this ill-gotten timber makes it way to China for manufacturing and then onto the U.S. The U.S., however, has some of the world's strictest laws on importing illegal timber (under the Lacey Act), and the Global Witness report prompted several U.S. companies to drop the wood in question. China, meanwhile, has no such laws barring illegal timber. And it is overwhelmingly the biggest importer of timber worldwide. Despite the growing array of threats, New Guinea still sustains one of the world’s largest forest tracts — with three-quarters of the island covered in native forest. But the next few years will be crucial. Will Papua New Guinea and Indonesia promote sustainable development – or wholesale forest plunder, mimicking what has happened across much of Southeast Asia? The large-scale destruction of New Guinea’s forests would not only imperil countless species and aggravate climate change, but would also rob many traditional communities of the diverse forests they have long relied on for their livelihoods. Jeremy Hance, a leading environmental journalist, is a regular contributor to ALERT.